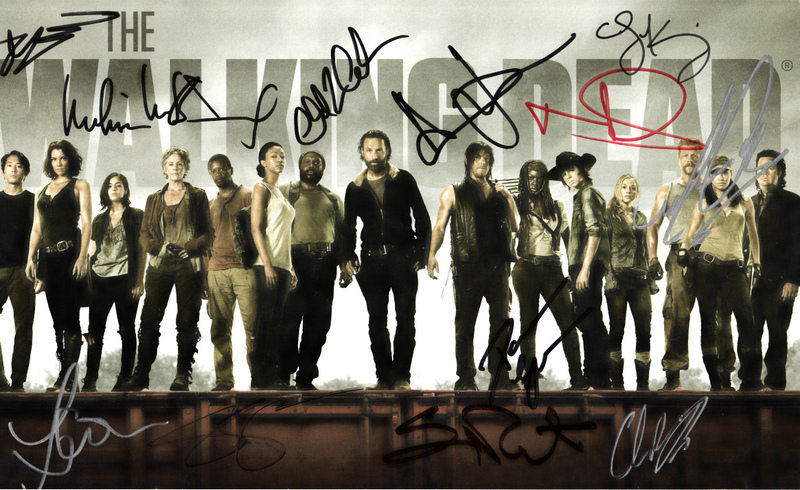 Roughly 7 by 12 inch Walking Dead photo card autographed in various pens by stars Andrew Lincoln, Chandler Riggs, Norman Reedus, Melissa McBride, Steven Yeun, Lauren Cohan, Danai Gurira, Emily Kinney, Michael Cudlitz, Chad Coleman plus director and executive producer Greg Nicotero and creator/writer Robert Kirkman for a total of 12 signatures. 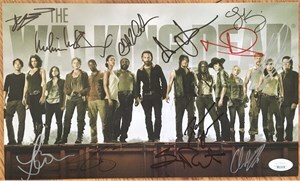 Obtained at extremely limited 2014 San Diego Comic-Con AMC booth signing (Kirkman was added later at a SkyBound signing), with photos from both signings, wristband from the Kirkman signing and certificate of authenticity from AutographsForSale.com. ONLY ONE AVAILABLE FOR SALE.